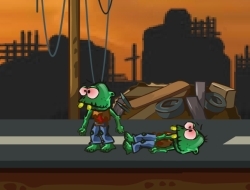 A zombie game is popular because the zombies arent really smart and you can blow them up with pretty much everything you can find around. This time it isnt any different, and it isnt any less fun as you will have lots of grenades and explosive barrels to play around with and send zombie parts flying around. The grenades will have different types of explosions and you can rotate them on the map to send the shrapnel wherever you want. Try to think every shot and deal as much damage to them as you can, for a bigger score in the end. Also use the environment to your advantage and blow up red barrels and activate switches. Use the mouse to place bombs and the arrow keys to rotate them. Zomblast 0.00 between 0 and 10 based on 0 votes.